need some fit help. I'm thinking of getting the Velobuild R-016 but not sure if I should got for the 52 or the 55. I did the fit calculator on competitive cyclists website and got the following results. Last edited by raudi; 05-11-2015 at 12:15 AM. Compare it to your old bike and go off that. Also you probably should give all the relevant information that you think a frame fitter would need in order to give you a fit. Your question is kind of a nothing question without it. My point exactly in one of mine previous posts in this thread. They have the warranty policy just as a selling tool which in practice never exists. In best case scenarion they re-sell you the product with slight discount so that they earn on you twice, nevertheless you are claiming the product under warranty case. So all various Greatkeens, Cycling jong, Joshan, HK FeiFan, Kode bikes, Konor bikes, Chinesswalton, Joy bikes, etc. are a bunch of scammers who are well awared that they are far far away from you and that basically there is nothing you can do to them...to the contrast to LBS to which you can always go to and require legally actions from you if you are in titled to (warranty case, etc.). The only thing which helps (within certain time frame) is to dispuite transaction, since as soon as this "Window" closed you can be 99% sure that they won't do anything to help you resolve the issue. The TT is the most important number. As kiwisimon mention, compare with tour old frame. Their a 2,5 cm difference in the TT length between the 2 sizes, its big. You probably want to aim at a stem lenght between 10 and 12 cm. Having the reach number would be easier. Competitive cyclist calculator is good but dont trusted completely. I might be wrong but Its seems oriented for an agressive (stretched) riding position. If you want something more relax, number might change. You might want to compare the results with the Pedal force calculator. You can set the Saddle height over the saddle in this one. Your old frame is your best starting point, as long as it fit you well. You might also want to check the price at Zhongwei, IPlay (IP-306), and carbon speed (CS-306). I was getting ready to pull the trigger on a Velobuild R-016, but having read back through the threads on here I'm starting to second guess dealing with them. Is velobuild to be avoided? I really the look and weight of the R-016. Geometry doesn't look to aggressive and it will take a Di2 upgrade down the line. Xiamen Iplay IP-306 and Xiamen Carbon Speed CS-306 sell the same or very similar product to the R-016. The review of the R-016 on the VB web site was in fact originally a review of the IP-306 frame - they change the name in the review when they start there company. If you look in the VB forum, you will see mention of the IP-306. I believe that Zonghwei is the manufacturer of the R-016. I am not shure if the IP-306 / CS-306 are manufacture by Zonghwei. The IP/CS 306 are from the same manufacturer. Carbon speed is a new company started by previous Iplay employee. Both frame are a mixture of T700 and T800 carbon - its bot clearly stated on their description. 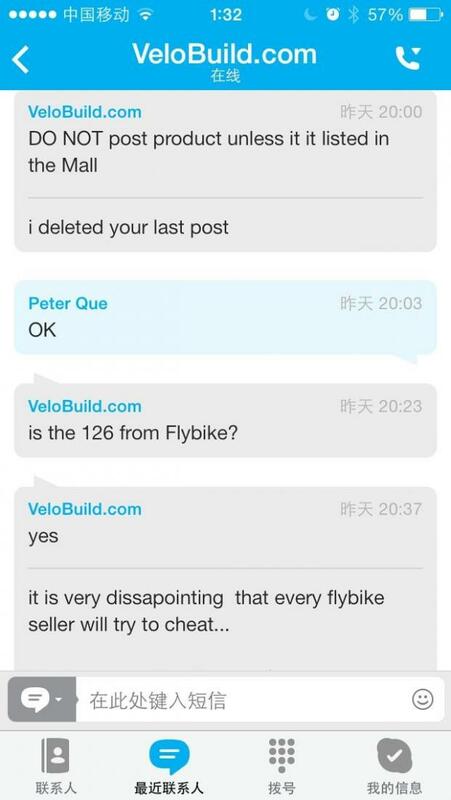 I have read a fair number of positive and also negative post about Velobuild. I have browse their forum and was negatively impress by the lack of recent post. If you are looking for a relax geometry frame the IP / CS306 (R016) seems appreciate, but have limited number of frame size. You might want to consider also the Miracle trade MT-MC696 (long head tube). I am also shopping for a new frame. Unfortunately I have not find many review on those frame that I have mention. Lots of information in this thread(s)! 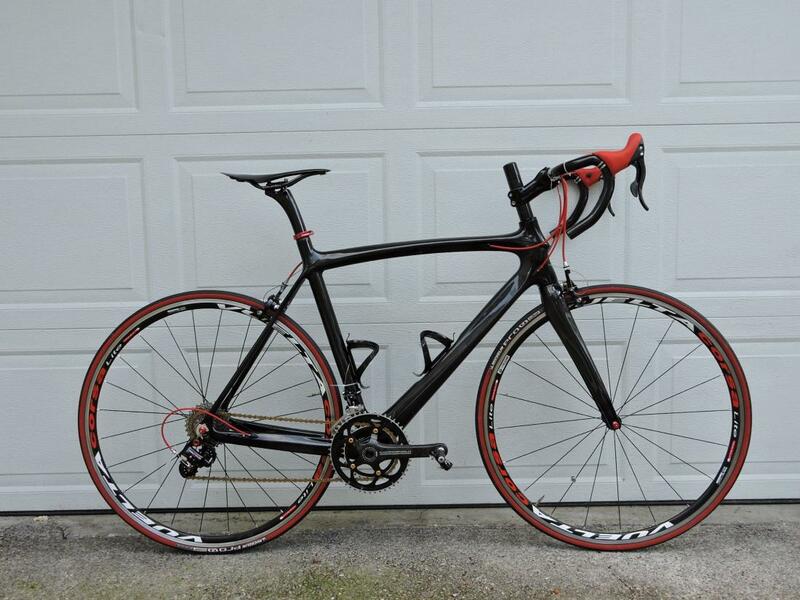 I am considering building a Chinese carbon fiber road bike. 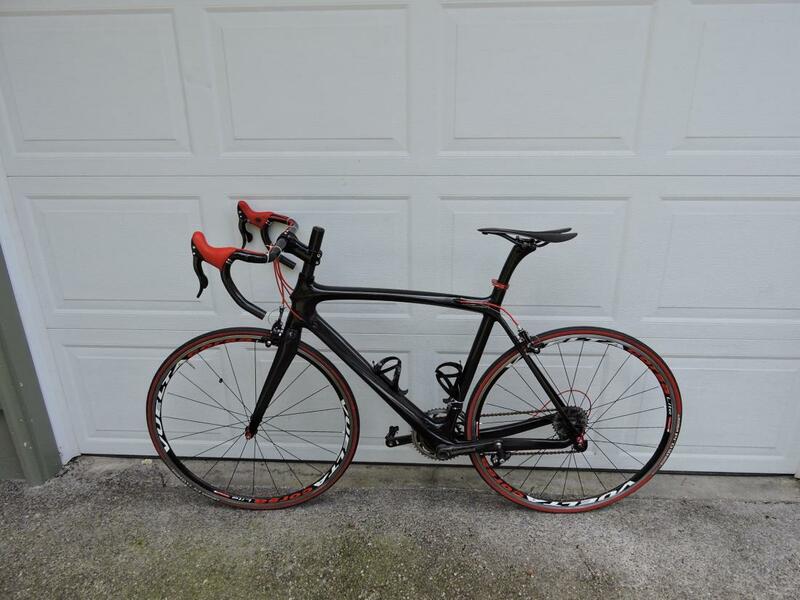 I have a Domane 2.3 that I ride quite a bit and I would like something a little snappier on the road. 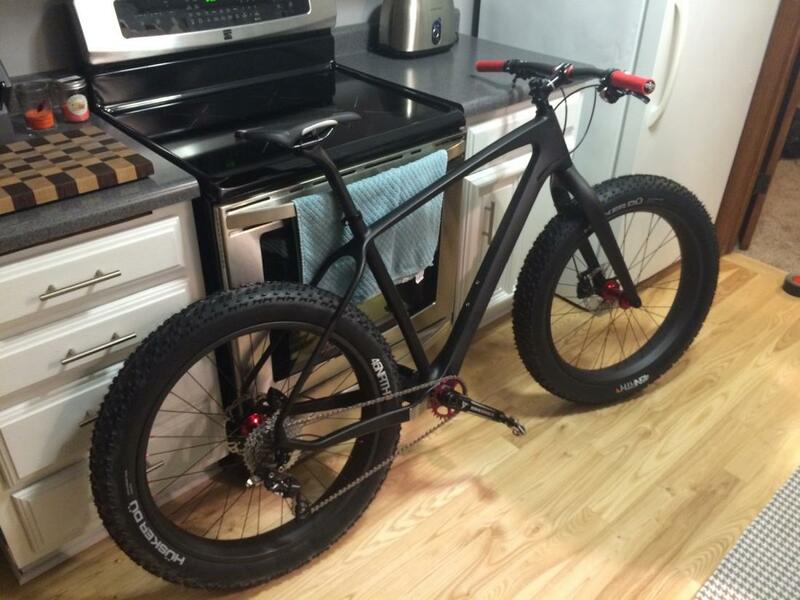 I built a Dengfu FM190 Fatbike (25.5 lbs!) that I am incredibly happy with. 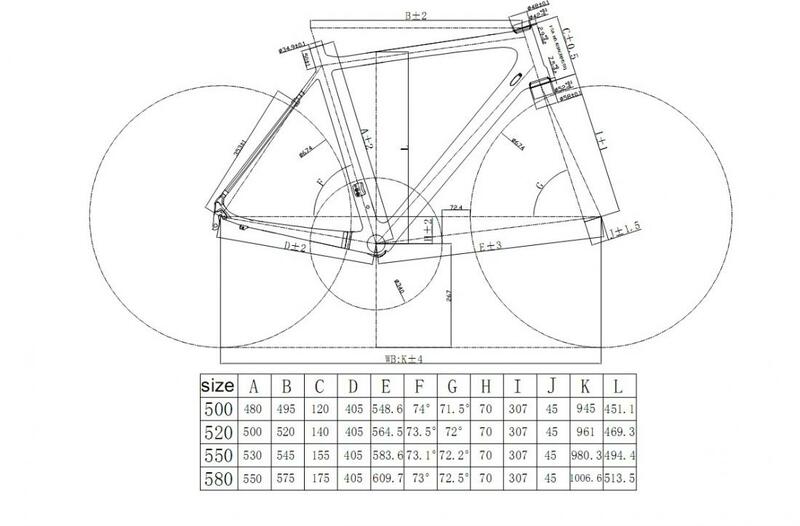 I was just curious if there is a cross reference sheet out there on what frame models correspond to their name brand frames, for example the FM098 looks a lot like a Venge! Im not certain which model I want to go with yet, 6'4" 180lbs, I ride a 60CM Domane, all my mountain bikes are XLs or 21". Any and all advice is greatly appreciated! 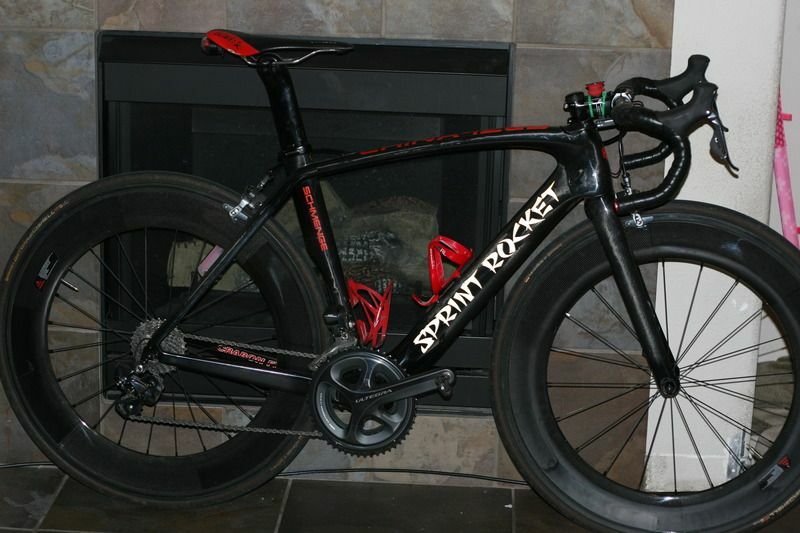 Here's my R-041, not sold anymore on Velobuildmall, It's a Schmenge. The FM-098 is an excellent choice. Is the MC696 the same frame as the FM-029 or the Zonghwei R-008 (R-027 on velobuild)? The geometry looks identical. I'm also hunting for a slightly more relaxed geometry frame. That is a cool looking bike. Well done. I got an FM098 last spring and its been great for me. No real issues working with DengFu. A bit of a language barrier and double/triple checking details of the frame build lead to a fairly lengthy email exchange, but when it was all said and done I got exactly what I wanted. 5,500 miles later and its still treating me quite well. The stiffness and power transfer were greatly improved from my last bike (cheapo Bikes Direct). I was so pleased with the product that I went back to DengFu for some 56mm deep wheels to complete the aero get-up. How much did you pay for the frame, fork, and shipping? I'm interested in the cervelo r5 lookalike. What sellers have this frame? I know velobuild has one but to price shop before pulling the trigger. I'm interested in the cervelo r5 lookalike. What sellers have this frame? The cost to make a mold isn't that great. They don't sell small amounts either. Sure, they're all genuine, yeah, go ahead and buy one then, I'm sure it's fine and nobody will ever know. You'll be so popular and cool, sounds like you have it all figured out. Well done. ,a see bit testy,are you ,no I have not figgered it out, and do you know the actual number of frames they have sold, one thing I learned in the U.S.Army in 22 years,is find the facts before you go into battle,on in circumstance,that's how I survived 4 tours in that wonderful middle east country. I was just looking at a possibility. Last edited by alfaromeo1; 05-16-2015 at 03:22 PM. I've lurked and contributed a bit in seeking details on Chinese carbon frames. About a month ago, after much hemming and hawing, I ordered a VeloBuild R-022. It's about 90% built, with fine tuning and fitting needed. VB-R-022, 56 cm, with fork, headset, seatpost, clamp, extra derailleur hanger, and carbon spacer stack, all from VB. On my front porch 22 days after order. All nicely finished and packed. Carbon stem, handlebar, and saddle are no-name Chinese from alternate sources. Campagnolo Centaur 10-speed group acquired over several months, new, except for carbon crankset carried over from old bike. Lots of titanium bits; pedal spindles, stem hardware, crank fixing bolt, seatpost hardware, cage mount screws, with more coming. Assembled in time for one test ride of 20 miles. Easy to build up. Fast, light, and very smooth riding. One key test involves climbing a short, steep hill near home. Ascended seated, riding on the 23-tooth cog, a first-time experience. Less mass than my old Cannondale. The cables/housings are zip tied right now. 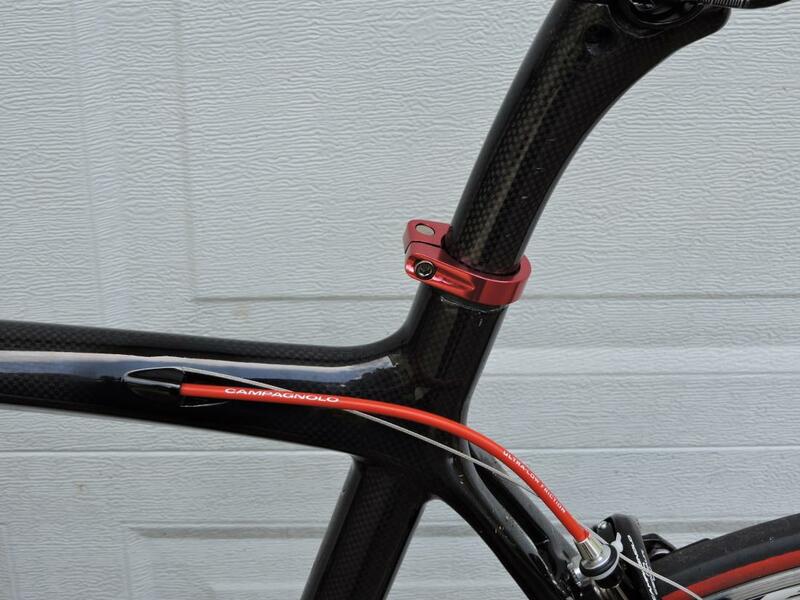 I’ll use strapping tape to hold them down, cut off the zip ties, add the gel pads, then tape the bars in Campy red. The cables themselves need to be dyked off and red cable ends added. The steer tube needs to be cut, but not until I’m comfortable with reach and position and other dimensions. The spacer stack will have a 5 mm red carbon slice, right in the middle, to line up with the seatpost clamp. Looking for red chainring bolts to replace the gold ones. Failing that, it’s back to black. Also looking for red pedal dust caps in ti or carbon. If there's any interest, I'll add more details in a subsequent posting. Complete departure: Am I the only participant on this site who has problems with the edit/input? Last edited by CycleguyJoe; 05-17-2015 at 07:19 PM. If I wait long enough, the rain will stop, won't it? Congrats on your new bike build. I went through that about a year ago. One thing I would suggest is to tilt the shifter/lever position up a little and tilt the handlebar down a little. Something more like this. I took some inspiration from your build, and contacted you. Thanks for your message. Yes, bar and shifter positions are still to be worked out. I deliberately sought a 17 degree angle for the stem, to get the bar height up without a long steertube spacing. Now's the time to get angles and dimensions finalized. Anybody have any info on the long lead-times from Dengfu? Purchased a bike from them early last month and have not had any contact after sending payment. Dealt with them directly "dengfubikes@163.com" (email on their front page) and after getting the invoice and sending payment, all communication has stopped. How long is the lead time? I'm told 6-10 days for paint but it's been... 3 or so weeks now. I bought IP-306 frame which is earliest on sale in VeloBuild Mall, and purchased one pair of 29er wheels from Peter last year as well. 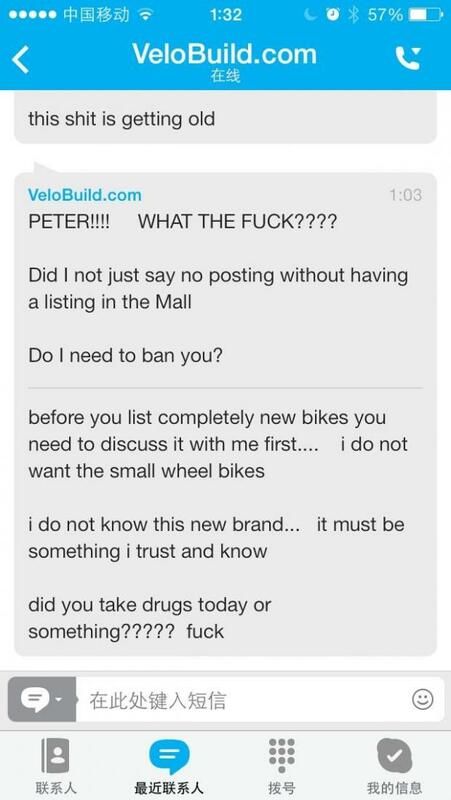 Peter was banned by the old man who was the original master of VB, and the geezer sold the whole VB forum including VB mall to Chris who is the current owner. Here are 2 pictures Peter sent me early last year, I totally understood why that geezer wanted to ban him on his forum. All the messages should be reviewed by them before they appear on VB forum now. Did I say something wrong? Correct me. Not sure which factory produces these frames, Flybike or Zhongwei, but I would like to choose a vendor who can provide reasonable price and best service, and honestly answering our questions. So I ended buying a R-055 and will be painting it to look like the Ceverlo R5. 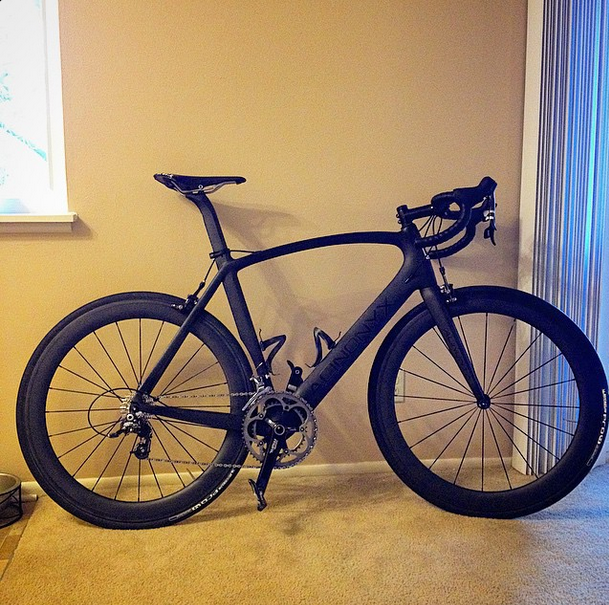 Not sure on the groupset yet, but I'm leaning to Sram Force 22 or Ultegra.